The Panasonic Lumix G9 is the brand's new flagship mirrorless camera designed to appeal to stills photographers, and will sit alongside the Lumix GH5 in the Lumix range. While the GH5 is revered among videographers thanks to its wealth of movie-making features, the GH-series has never really managed to make a name for itself with stills shooters. With the Lumix G9, Panasonic hopes to changes this. You can read our hands-on Panasonic Lumix G9 review to really get under the skin of the new camera, but here's our quick overview to get you up to speed. 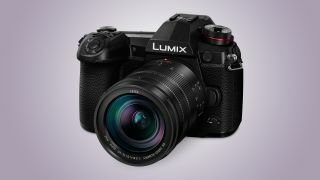 The Lumix G9 uses the same 20.3MP Micro Four Thirds sensor as the GH5, but the new camera takes advantage of Panasonic's latest Venus processing engine, which the company says will deliver refined image quality. There's also a new High Resolution Mode on the G9 that's capable of delivering 80MP (equivalent) images, in both JPEG and raw file formats. This works by combining eight images that have been taken in rapid succession, with small sensor shifts between each one, so a tripod is essential when using this mode. The Lumix G9 gets an upgraded in-body image stabilization system, enabling you to use a shutter speed 6.5 stops slower than would otherwise be possible and still achieve a sharp shot. It's also possible to combine the 5-axis B.I.S. (Body Image Stabilizer) on the Lumix G9 with an O.I.S. (Optical Image Stabilizer) compatible lens to compensate for larger movements, with Panasonic claiming it to be especially beneficial when using telephoto lenses. This 5-axis Dual I.S. anti-shake system works for both photo and video capture. The Lumix G9's burst shooting speeds get a big boost over those offered by the GH5 (and a lot of rivals for that matter). While the GH5 could shoot at a respectable 9fps with continuous AF, the G9 more than doubles that to 20fps, while if you can live with the camera locking focus on the first frame it's possible to rattle off full-resolution images at 60fps. The G9's electronic viewfinder is the largest in its class, with a high magnification factor of 0.83x (35mm equivalent) and an impressive 3,680k-dot resolution. And the good news for action shooters wanting to take advantage of the Lumix G9's burst shooting speed is there's now zero blackout when shooting at these high speeds. There’s also a new night mode, plus an AF Point Scope integrated into the viewfinder design. The Lumix G9 features an all-new design, with the most notable addition being a status LCD display on the top plate. This is a feature found on many high-end DSLRs, but one that's rare on a mirrorless camera, and which works as a quick-reference guide for the camera's key settings. As you'd expect for a camera aimed at serious enthusiast and professional photographers, the Lumix G9 features tough and durable front and rear magnesium alloy frames. It’s also splash-proof, dust-proof, and freeze-proof down to -10 degrees. While the Lumix G9 doesn't have quite the same impressive breadth of video features as the Lumix GH5, it can still capture beautiful 4K footage at 60fps. The Lumix G9 gets Wi-Fi compatibility as well as Bluetooth 4.2. This is often referred to as BLE (Bluetooth Low Energy) and enables a constant connection with a smartphone or tablet, making it quick and easy to transfer your shots while keeping power consumption to a minimum. The Lumix G9 will be available from January 2018 priced at £1,499/$1,699/AU$2,499 body-only. It'll also be available in two kits: the M kit with a Panasonic 12-60mm f/3.5-5.6 standard zoom lens will be priced at £1,699/AU$3,499, and the L kit with a Leica 12-60mm f/2.8-4 zoom lens will cost £2,019/AU$3,499. US pricing is still to be confirmed for the two kits.